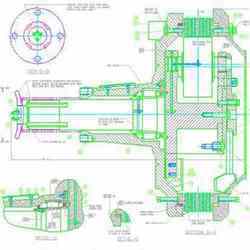 Ours Mechanical Drawing Conversion can be used to create artwork for Automotive Design, Architectural Plans, Engineering Drawings, or Electrical Circuit Diagrams. We can create new drawings from design data and sketches. We can also create assembly drawings for all types of mechanical assemblies, architectural schematics, structural designs etc. And then transform them Into perfectly accurate multilayer cad drawings. We are committed to give you the best cad conversion and cad file conversion results at very competitive prices. We can work on over wide range of image formats such as img, jpeg, pcx, pdf, pict, gif, tiff, etc. And convert them into fully editable multilayer digital formats. If you provide s With your cad projects and drawings (As scanned images), we can process them, and have them sent back to you with least time. We are specialized in the field of Mechanical Engineering. Starting from heavy fabrication to very complicated machine components. Also drafting of the new machine developments & changes in the old machines & its components. We also offer CAD Conversion & G. I. S. Works. We also work on Electrical Designing & Drafting Work for Five Star Hotels & Regular Building Projects with Licensed Electrical Contractor & also Monitoring the Projects at site.